On the morning of August 30, 1945, Ensign Robert L. Voight was scheduled to take off from Westerly Auxiliary Naval Air Station for a training flight. Just as he was taking off on Runway 7, the engine of his F6F-5 Hellcat, (Bu. No. 78419), began to misfire so he set the plane back down and applied full brakes. At this point Ensign Voight was near the end of the runway and the aircraft was still moving fast. The plane then went off the runway and flipped over on its back. Fortunately Ensign Voight was not seriously injured. 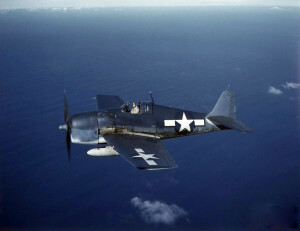 A similar accident had occurred at the same airfield on August 2, 1945, in which another F6F-5 Hellcat, (Bu. No. 78413), experienced engine failure just after becoming airborne. Source: National Archives AAR W7-45, TD450830RI, via Larry Webster, Aviation Historian, Charlestown, R.I.